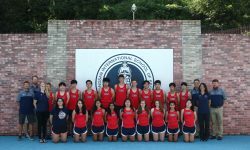 At the beginning of the season, it would have been a reach to create the goal of finishing among the top two teams in KAIAC, but the hard work and camaraderie of the teams generated the success that both teams had. Hedvig Holmberg took the girls’ school record and the overall KAIAC title, and four other Guardians moved up on the record boards. The 2013-2014 teams had runners holding three of the top ten boys times (Jared Swanson, Jack Bibb, and Dane Parsons) and three of the top ten girls times (Hedvig Holmberg, Hannah Parrish, and Minsoo Bae). Beyond all of the records, though, this team will go down as one that loved being together and made the fall of 2013 better for all on the teams.